In the past home composting was undertaken by gardeners to reduce waste, which would otherwise have been burnt on a bonfire, and to supplement manure as a means of increasing soil fertility and organic material in the soil. In recent years householders with smaller or no gardens have joined the craft for environmental reasons and to reduce the vast amount of waste sent to landfill often with the encouragement for their local authority. Much of the advice published is directed towards the later group with emphasis being placed on composting kitchen waste such as uncooked fruit and vegetable peelings and scraps, tea bags, coffee grounds and old cut flowers. It is also assumed that most gardeners, including those with larger gardens or allotments, do not have the time or inclination to operate traditional hot composting systems and have adopted cool or cold methods of composting even when they use traditional wooden compost bins or pallet heaps. The emphasis is on composting garden waste such grass cuttings, annual plants and weeds (before they have set seed) and soft prunings. Such lists of items that cannot be composted should be qualified with the statement that they should not be composted unless an appropriate technique or the correct equipment is used. The traditional compost heap or pile is still used by many allotment gardeners and those with larger gardens and has the advantage of being able to grow to meet the demands placed upon as compostable material becomes available. However it is more likely to attract rats than a contained bin. For instance meat, non-liquid dairy and cooked food can attract vermin and should not be home-composted for this reason using a compost heap or a “conventional” compost bin, such as is provided at a subsidised rate by under local council schemes unless you are happy to provide a home or feeding station to the local rat population. They can however be composted in an enclosed vermin proof domestic systems such as the Hotbin, Green Johanna or larger composters such as those made by Jorra, Ridan or Rocket specifically design to deal with food waste including waste from schools and commercial organisations such as cafes, restaurants, colleges etc. There are now a number of wormeries specifically marketed to convert dog faeces into compost that can be used on flower gardens provided the dogs are mature, regularly treated for parasites and not pregnant. Details of the items that can and cannot be composted are given below and in that list I have attempted to distinguish between those items that can be composted by cold composting methods using a conventional bin and enclosed hot composting systems. Alfalfa pellets, such as rabbit and gerbil food can be hot or cold composted but mix well to avoid them matting when wet. 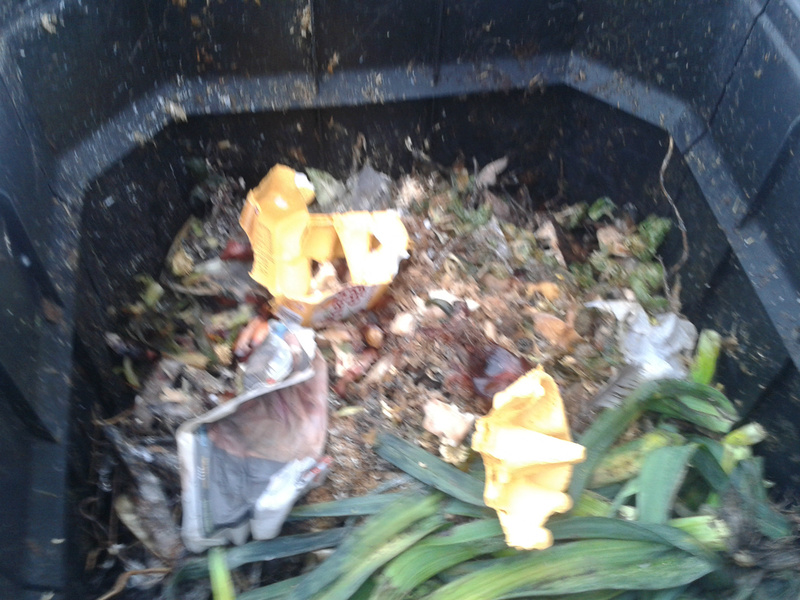 See under food waste it is recommended that these are only composted in a specially designed enclosed container. A "Green". Crush or chop before composting (bruised apples compost more quickly). Can be composted using cold (cool) or hot composting. Suitable for wormeries but do not add large amounts to a wormery or indeed a compost bin. Larger numbers of windfall apples can be trench composted or a special apple and worm heap can be made. "Greens" These can be messy and are best composted in a bin rather than heap. Wood ash can be composted using cold (cool) or hot composting but do so in moderation adding only thin layers of ash.Wood ash will increase soil alkalinity and should only be used on acid soils which need additional potassium to acheive balance (Rodale). Small quantities of Coal ash mixed with wood ash may be composted but significant amounts of coal ash on its own should not be composted as it contains high levels of sulphur. Ash from lump wood charcoal can be composted using cold (cool) or hot composting but that from BBQ briquettes may have been chemically treated best not to compost. The leaves from trees with Ash dieback may be composted on site however burning on site is considered the prefered option. Although householders may also use burial in the ground. The forestry Comission indicate that there is no clear scientific evidence currently available on the effect of composting on Chalara spores. The temperature increase during the composting process and the presence of decomposition fungi, which will decompose leaf material, rendering it unsuitable to sustain Chalara, might lead to its destruction. However, given the uncertainty, it is advised that any resulting compost is spread on or near the infected source Any leaves which are not destroyed or otherwise processed (e.g. through composting) should not be used for mulching or use on allotments where there is a likelihood of spreading the infection. A "Green". Both the fruit and peel can be composted using cold (cool) or hot composting. Suitable for wormeries. They are best sliced, cut into quarters or squashed. Might attract rodents to an open heap or pile. Fresh bamboo leaves and stalks are a "Green" but if dry they become a "Brown". Older tough stems should be split or shredded. A "Brown" very slow to compost. A useful buking agent and addition to compost bins containing a lot of greens. I have found a reference to bat faeces being a composted in both piles and heaps. Bat Guano is sold commercially as a fertilizer. Bat droppings in the UK are dry and crumble away to dust. In Britain all bat species and their roosts are legally protected, by both domestic and international legislation. It is an offence to deliberately capture, injure or kill a bat, intentionally or recklessly disturb a bat in its roost or deliberately disturb a group of bats, damage or destroy a bat roosting place (even if bats are not occupying the roost at the time), possess or advertise/sell/exchange a bat (dead or alive) or any part of a bat or intentionally or recklessly obstruct access to a bat roost. Can be hot composted. Not suitable for cold composting. Mixed seed: The general advice when cold composting is not to add plants when they are in seed as the seeds will germinate either in the bin or, more importantly when the compost is spread on the garden. The same applies to birdseed if cold composted while some of the seeds may decompose during composting others will survive the cold composting process. Cold (passive) composting is therefore not recommended for most birdseed although some manufacturers sell treated (baked) birdseed that will not germinate. Waste from untreated mixed birdseed can be hot compostied, subject to the correct temperature being reached and held. Peanuts (sold for bird food): It is not unusual for some of the nuts in a “peanut feeder” particularly those at the bottom of the feeder to become stale and occasionally mouldy, these can be composted. Sunflower seeds: The hulls of Sunflower seed hulls are allelopathic, and may inhibit the growth of some plants, if they are left on the garden. However, compost will degrade any toxins and even if it did not a small amount such as might be generated from waste bird will not affect the compost. It is advisable to leave the compost to mature at the end of the active composting stage rather than use it before maturation. . If cold composting seeds might start to germinate but these can be removed from the compost by hand or turned when aerating the bin. If a tumbler or similar bin is, being used turn should mix the contents. Sunflower Hearts, while being more expensive, result in less waste. A "Green". Can be hot composted, or buried by other material in a sealed bin if other methods are used it may attract flies and rodents. Can be composted using cold (cool) or hot composting as well as buried in the garden. Old abandoned birds nests can be composted but I would leave them family in the tree or shrub for at least a year in case they can be used to rehome another bird. Can be hot composted. Not suitable for cold composting unless using a "food compost" system. Leaves are a "Green". Can be composted using cold (cool) or hot composting. Chop the stalks into smaller pieces. Less than 4mm is recommended. Suitable for wormeries in “kitchen waste” quantities. As for bread. Can be hot composted. Not suitable for cold composting. Cardboard, cereal packets, kitchen/toilet roll tubes. "A Brown" Can be composted using cold (cool) or hot composting Iit is best torn up and “Crumpled” to provide air pockets Suitable for wormeries. Idealy it should be soaked before addition to the worm bin. Can also be used in Grassboarding . A "Green". Carrots can be used in a wide range of compost bins and cut into pieces in wormeries. Most cat litter cannot be composted although some labelled as “compostable” can be hot composted. As there is a disease risk I would advise against composting cat litter contaminated with faeces. If such waste is to be composted I would suggest that it is only composted where the composting temperatures are being monitored, the cat is regularly wormed and the compost is only used on flower gardens to which young children do not have access. As there is a disease risk from pathogenic bacteria and parasites e.g. Toxoplasmosis I would advise against composting cat faeces. If such waste is to be composted I would suggest that it is only composted where the composting temperatures are being monitored, the cat is regularly wormed and the compost is only used on flower gardens to which young children do not have access. See Solid Diary products. Can be hot composted. Not suitable for cold composting as it may attract vermin. Can be composted using cold (cool) or hot composting. As there is a disease risk from pathogenic bacteria with all manures hot composting where the composting temperatures are being monitored would be the safer option. Shredded. Can be composted using cold (cool) or hot composting but it is slow. Probably best to send it to for composting by the Council. Can be composted using cold (cool) or hot composting. Old clothes made of wool or cotton can be composted using cold (cool) or hot composting if cut into small pieces. These can also be recycled. A "Green" Can be composted using cold (cool) or hot composting but probably best dug in as a green manure. Can be hot composted. Not suitable for cold composting or composting in open hot systems if there are any remains of meat on them as they may attract vermin. Crush before composting, these can be very slow to compost. The shells could be baked in an oven to make crushing easier. A "Brown" Can be composted using cold (cool) or hot composting and provides food for the worms. Can be composted using cold (cool) or hot composting. Comfrey tea acts as an accelerator being rich in potash and nitrogen (Liquid Feed ) Not recommended for wormeries. Can be composted in an enclosed hot composting system but only in small quantities. Not suitable for cool composting systems. A " Brown" Can be composted using cold (cool) or hot composting. Should be chopped up or shredded otherwise the cobs will compost slowly and may need returning to the composter a second time. Suitable for wormeries. Can be composted using cold (cool) or hot composting. Shred or “Crumple” to provide air pockets. Suitable for wormeries (wet first). Can be hot composted. Will survive cool composting. Grass can be drowned by soaking in a bucket of water prior to composting. Natural Corks from wine bottles can be composted but will not compost within a "reasonable" time scale so may need putting through the bin twice. "Plastics" corks cannot be composted. Can be composted using cold (cool) or hot composting. As there is a disease risk from pathogenic bacteria with all manures hot composting where the composting temperatures are being monitored would be the safer option. However cow manure has been used on gardens since ancient times and the potential risks should not be exaggerated. Can be hot composted in a closed vessel. While they can be composted in a hot heap or pile it may smell and attract fles and rodents so is not recommended. Mix any liquid with rice or other absorbent. Not suitable for cold composting. Cut Flowers. Cut flowers that have passed their best can be composted in both hot & cold systems. It is better to cut them into shoert lengths. Although these could be composted in enclosed hot composting systems it is usually not recommended to compost liquids as they tend to make the compost to wet for effective aerobic composting. They will also cool a hot composting bin. Can be hot composted. Will survive cool composting. Can be drowned by soaking in a bucket of water prior to composting but probably best sent to Council compost site. Can be hot composted. Many diseases can survive cold composting. It might be safer to send diseased plants to the council compost site. A "Brown" Can be composted using cold (cool) or hot composting. Tear or shred Suitable for wormeries. Paper envelopes can be composted using cold (cool) or hot composting. Remove acetate windows first. A "Brown". Slow to compost so best treated separately in their own "everygreen" leafmould plastic sack or bag. Small quantires can be added to the bin if shredded and acompanied by plenty of "Greens"
Can be hot composted in small quantities without causing problems. Not suitable for cold composting or composting in open hot systems as they may smell and attract vermin. Can be hot composted in a closed container. Not suitable for cold composting. A "Green" Can be composted using cold (cool) or hot composting. Purchased cut flowers will probally have been treated with chemicals to control insect pests and I have seen recommendations that they be washed before being put in the bin (dunking them in a bucket of water might work). Can be hot composted if allowed to warm and defrost first. Larger items should be chopped. Not suitable for cold composting. Can be composted using cold (cool) or hot composting. Will take a long time. May survive cold composting. A "Green". Compostable in hot or cool composters but is a citrus fruit and should not be added to a wormery. "Green" Can be composted using cold (cool) or hot composting. Add in small layers and mix well to avoid a smelly anaerobic mess. Can be composted using cold (cool) or hot composting. As there is a disease risk from pathogenic bacteria with all manures hot composting where the composting temperatures are being monitored would be the safer option. However if you keep these pets you will be exposed to the organisms in the faeces anyway. A "Brown" Can be composted using cold (cool) or hot composting. Excellent if first used for herbivore or chicken bedding. Mix well with other materials. A "Brown. Slow to compost even for a leaf so is best shredded and made into leafmould in a separeat slow plastic bag (I like an old compost bag turned inside out). "Green" Suitable for hot and cold composting in bin or heap. Spent hopsare often available foc from craft breweries and are high in nitrogen. Can be composted using cold (cool) or hot composting. As there is a disease risk from pathogenic bacteria with all manures hot composting where the composting temperatures are being monitored would be the safer option. However horse manure has been used on the land since ancient times and the potential risks should not be exaggerated. Can be hot composted but it is not recommended. Small scale Anaerobic Digesters exist which will convert human faeces to methane gas for cooking or heating. Specially designed composting toilets are also available. This should be treated an invasive weed. Do not compost at home. Kelp (and seaweed) can be hot or cold composted . Also high in potash. A "Brown" Use to make leafmould in a sbag reserved from leaves that are slow to decompose. Old leather items such as belts, wallets or bags can be composterd but are best cut up before being added to the bin. May requiring retuern to the bin for a second time. A "Green". Composts by all methods including wormeries. All manure can be composted but as it may contain pathogens, such as Salmonella, This applies to both herbivores, such as cattle, and meat eaters so is probably best to use hot composting for both although the risks associated with herbivore manure that has been allowed to mature before cool composting is relatively. Do not add composted manure to the soil around plants close to harvesting. See specific reference for each animal for more details. Can be hot composted chopped into small pieces. Bones (even crushed) will take a long time to compost. Not suitable for cold composting. Can be composted using cold (cool) or hot composting. Seeds may survive cold composting. Suitable for wormeries chopped into small pieces. Although milk could be composted in enclosed hot composting systems it is usually not recommended to compost liquids as they tend to make the compost to wet for effective aerobic composting and smell!. Can be composted using cold (cool) or hot composting but is very slow. It helps to mix with the moss with grass. Can be composted using cold (cool) or hot composting. Best to crack nuts before composting. Will take a long time. May survive cold composting. The brown tape used to seal parcels is will survive hot or cool composting. Where possible it should be removed from cardboard before it is composted any missed at this stage can be removed from the final compost. Can be composted using cold (cool) or hot composting but it is slow and is best recycled or used for grass boarding. Shredded paper can be composted and is also good in a wormery. Paper towels can be composted provided they are not contaminated by chemicals. Passion fruit vines can be composted but may not be killed by the composting process, even hot composting will not be effective unless high enough temperatures are reached and maintained. It is better, as with perennial weeds, to make sure the vines are dead before putting them in the bin. This can achieved by drying them in the sun or soaking them in boiling water. They should be cut into small pieces before composting. I would avoid composting the roots. Old peat from grow bags etc can be composted using cold (cool) or hot composting. Can be composted using cold (cool) or hot composting. As there is a disease risk from pathogenic bacteria with all manures hot composting where the composting temperatures are being monitored would be the safer option. Because of the diet of pigs do not import the manure from another site. Can be hot composted. Not suitable for cold composting as they may attract vermin. Can be hot composted. Larger items such as baked potatoes should be cut into smaller pieces. Not suitable for cold composting. These can be composted. Check plants for snails and other aquatic creatures. Old potpourri can be composted. If added to the kichen caddy it helps mask the smell of the day or two before it is empied into the compost bin. Potato plants, including those that are blight infested, can be composted using cold (cool) or hot composting. Infected potato tubers should not be cool composted. Tubers that are cool composted may crop inside the bin. Peelings from healthy potatoes can be added to the wormery. Can be composted using cold (cool) or hot composting. Suitable for wormeries if it does not include onion. Tomato seeds will survive the cool composting process. Can be composted using cold (cool) or hot composting. May be added as a bulking agent to some food composting systems. Can be composted using cold (cool) or hot composting some recommend washing to remove salt first. High in potash. Can be composted using cold (cool) or hot composting. Suitable for wormeries. Can be composted using cold (cool) or hot composting. At present most bags contain plastic and will survive the composting process. The bag can be torn open and the loose tea added or better still fully compostable bags can be used. See the item at the end of this section for more informaton. Can be composted using cold (cool) or hot composting. Seeds may survive cold composting. Suitable for wormeries. Can be composted using cold (cool) or hot composting. Plants with blight may be composted but I tend to send them to the Council composting site. Seeds may survive cold composting. The fruit can be added to the wormery. Tobacco Stems and leaves: It is better to compost the tobacco than smoke it. Turf is usually composted separately from the compost heap using a turf (or sod) pile. A stack of turf will rot down to produce a really good material that can be used in making homemade potting composts. Can also be composted using cold (cool) composting , it may block or reduce the air flow in a hot heap. Turf can be incorporated in a Hugelkulture mound. Can be composted using cold (cool) or hot composting. Larger twigs are best chipped or shredded. Twigs are often added at the bottom of the bin when starting to compost to aid air circulation. Material from organic carpets e.g., cotton or wool, pet hair can be composted using cold (cool) or hot composting that from synthetic cannot. Can be composted using cold (cool) or hot composting. Suitable for wormeries but do not over feed. Young annual weeds that are not in seed can be composted using cold (cool) or hot composting. Perennial weeds can be hot composted but will survive cool composting. Can be drowned by soaking in a bucket of water prior to composting but probably best sent to Council compost site. Can be composted using cold (cool) or hot composting. Best chipped or shredded. Twigs are often added at the bottom of the bin when starting to compost to aid air circulation. Can be composted using cold (cool) or hot composting with small amounts being added to the conventional compost bin, and many of us who keep chicken will be doing this after the birds added fertiliser to the wood chip. Wood chip may also be added as a bulking agent to some food composting systems. Larger quantities can be composted in a separate wet heap. Ideally, the heap should be larger than the normal minimum of 3ft/1meter square is required for best results, at least 6ft square and 4ft high is recommended. As with the traditional heap, the wood chip heap should be built in layers, each layer being soaked with water, or compost tea. The pile can be covered with wet leaves and a tarpaulin. It should be checked regularly and watered if dry. The compost should be ready as mulch in about 3 months and as compost in about six months. Although yogurt could be composted in enclosed hot composting systems it is usually not recommended to compost liquids as they tend to make the compost wet which prevents effective aerobic composting and may well result in a smell!. The war on plastic waste is due to bring a benefit for composters according an item in to the Observer (26/1/18) as the COOP is in the final stages of developing a plastic free biodegradable teabag. The Coop sells 367 million teabags a year hopes to have the new bags in their shops later this year. As some allotment plotholders seem to the chance to have an occasional cup of tea this might be of interest. Teabags are usually listed as compostable items but in recent years more and more composters have complained that the bags do not actually decompose when composted. This is because most bags now including a non-biodegradable plastic (polypropylene) so that they can be more easily heat-sealed during manufacture. The bags may be described as ‘70% or 80% compostable which includes the tea leaves and paper element of the bag but not the plastic. Teabags accounts for about 150 tonnes of polypropylene going to landfill, AD or composting a year in the UK alone.